Denver’s newest master-planned industrial park landed its first full-building user. 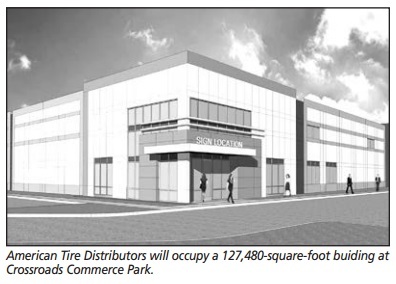 American Tire Distributors, the country’s largest tire distributor, signed a long-term lease for a 127,480-square-foot building at Crossroads Commerce Park, located at the southwest corner of 55th Avenue and Washington Street in Adams County. The building represents a relocation and expansion for the company, which has been in the Denver market for eight years. American Tire Distributors is the second and largest company to announce its relocation to Crossroads Commerce Park, which broke ground in August and eventually will house up to 1 million sf of Class A industrial space. Empire Staple Co. will own and occupy a 61,870 build-to-suit in the 77-acre park, located at the crossroads of Interstates 25 and 70. The building ATD leased is among three buildings totaling 640,000 sf that Trammell Crow initiated on a spec basis. It is slated for completion next July. Future construction will include build-to-suits for sale or lease to users. “It is very exciting to have a full-building lease completed within weeks of our official groundbreaking. ATD’s tenancy underscores the compelling central location, ease of access to key interstate highways and the convenience to customers, which the site represents,” said Ann Sperling of Trammell Crow Co.
Trammell Crow is developing Crossroads with capital partner Principal Real Estate Investors. Murray & Stafford is the general contractor and Ware Malcomb is the architect for the project, as well as the ADT building. Mike Wafer, Tim D’Angelo and Michael Wafer Jr. of Newmark Grubb Knight Frank represented Trammell Crow in the transaction. Josh Allred of Jackson & Cooksey in Dallas-Fort Worth represented the tenant.